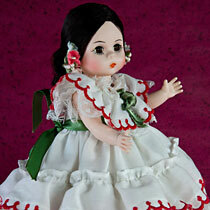 Doll from Panama dressed in white pollera dress. 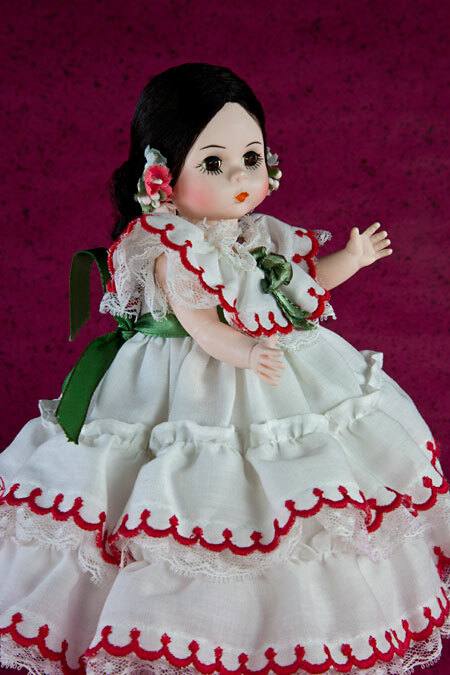 The full skirt has several tiers of ruffles, trimmed in red. 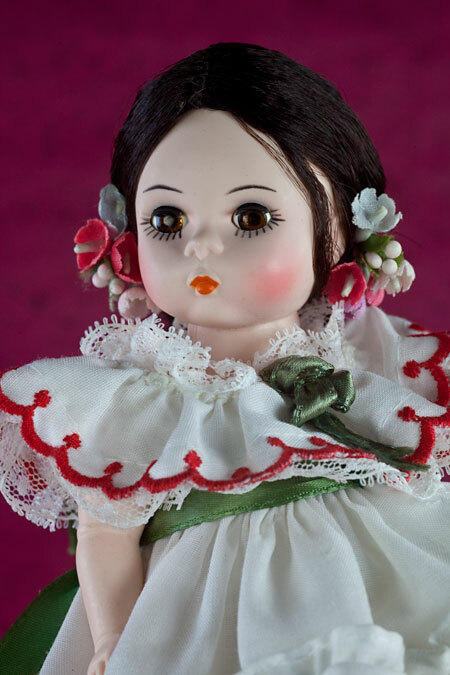 The doll is a plastic jointed doll with eyes that open and close. 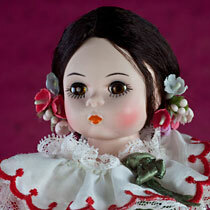 Her synthetic black hair is tied in the back, and she has flower ornament (called tembleques) on the side of her head. She is wearing white bloomers and petticoats. 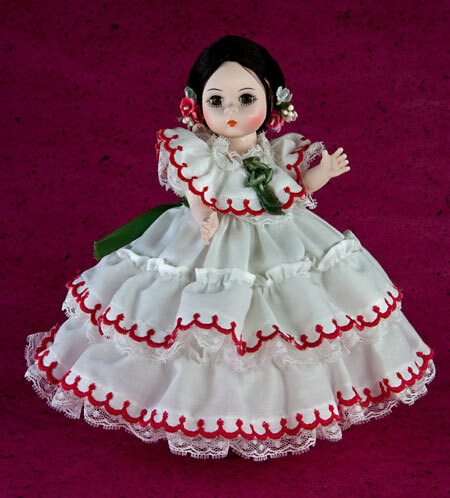 In this culture, the pollera dress is worn during the Panamanian national dance, El Tamborito. She is wearing gold earrings and necklaces. I folded my Pollera carefully and placed it in my backpack. It was very pretty, with a mixture of blue, reds, oranges and violets. 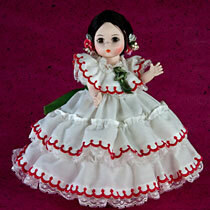 I was on my way to dance class where I was learning the Tamborito. It is one of the many cultural folk dances of my country, Panama. 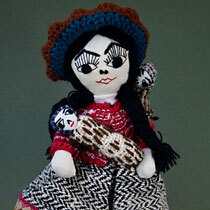 The Pollera is the dress that women wear to dance the Tamborito. My name is Katrina and I am 16 years old. 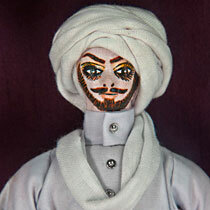 My father is a postal worker and has always wanted me to be a folk dancer. He loves Panama, and he wants me to learn as much about Panama as possible. I was so excited on the night of my first performance. As the curtains opened, the drums began playing, the singers sang, and we all danced. The audience loved the show! I could not wait to take the boat tour. I lived in Panama all my life, but I had never crossed the famous canal. This canal connects the Pacific Ocean to the Atlantic Ocean so ships can pass through. 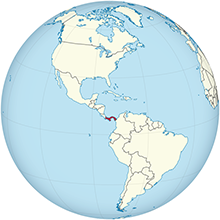 It is a fifty mile trip that cuts across Central America. My dad told me that it took 34 years to build the canal—starting in 1880 and finishing in 1914. Over 80,000 people helped to build the canal. They had to dig through mountains and swamps. As they were digging the canal, over 30,000 people died (many from malaria).